Well Jason and I and some family have been talking. And some of us think that Madison is starting to look more like me now. 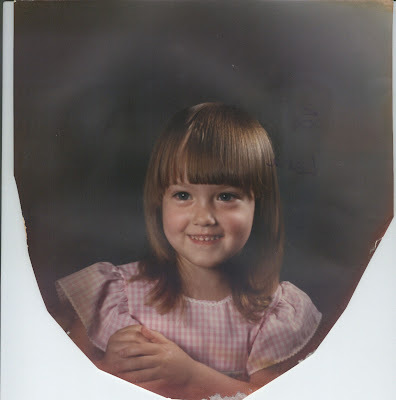 So I have posted a picture of me when I was 3 and a picture of Maddie that I just took (excuse the cheese on her face, she was having Ham and Cheese). So tell us what you think. I wish I had a picture of Jason at that age as well but I don't. Maybe I'll get one and repost with a picture of Jason and Maddie and I then you can really compare. Oh well for now this is what we've got. So what do you think??? Guess who has tooth #2!!!! JONAS!!! His second tooth on the bottom broke the skin yesterday. Ever since he has been cutting teeth, he has not been such a good boy. He's very whiny and clingy. I hope it's just b/c of his teeth and not b/c this is the NEW Jonas. I have patience with him b/c I just keep reminding myself that he's in pain but sometimes Jason and I both want to rip our hair out. But regardless we love our little boy. I do feel bad for him though. His first tooth is only like half way thru and now he's cutting this one. He doesn't even get a break. Maddie was like that too. Just one right after the other. Though I guess if it's that way, they are actually done teething faster. Well I guess that is that. Just wanted to inform you guys so you know what's going on at our house.